The move up seemed to be continuing and the first impression was that we were seeing a first period of appreciation in some time. But the operative word here is “seemed.” If we take a closer look at what the current environment really is, the picture is far less pretty. However, writes Budish, this protection is very expensive (the Bitcoin network uses about as much power as Ireland to run). And although Bitcoin’s value could theoretically increase almost without end, the blockchain’s security can increase only linearly, as more mining power is added to the network. That’s unlike other forms of security, such as the cryptography used in the traditional financial system, which, like adding a lock to a door, adds protection for a relatively low cost. The long-story-short version of the above is that in the future, there might be disconnect between Bitcoin’s value and the security of the network should the currency appreciate. This might be a limiting factor as far as the growth of the Bitcoin market is concerned. This analysis is generally interesting in that it presents a rigorous approach to arrive at its conclusions and is not very hand-wavy. So, while we can’t be absolutely sure about the trajectory of Bitcoin, we now have an analysis suggesting the as Bitcoin grows, the market might be under stress from majority attacks. The practical implications of this might be that in the case of serious Bitcoin appreciation, we might experience instability in the system or the costs of defending Bitcoin might grow, decreasing the attractiveness of the currency. But all this doesn’t necessarily mean that Bitcoin can’t grow – it’s rather a suggestion that in order for it to grow, the Bitcoin community will have to figure out a way to deflect majority attacks. On BitStamp, we are seeing a move to the upside. And a move above the April 1 low. On the face of it, this might look very bullish. But by now, we should know better. 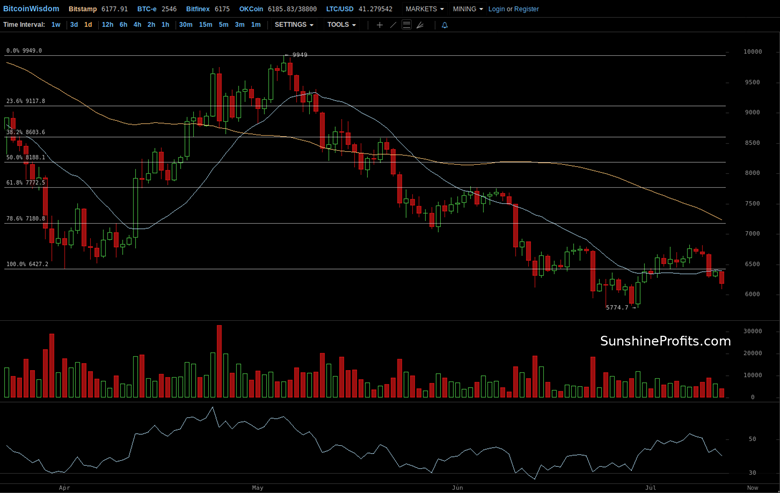 Yes, Bitcoin went above the April 1 low and this is a bullish development. The question is rather: “How bullish is it?” And the answer to that is: “The bullish implications are limited.” First of all, the April 1 low is a moderately important development in that it’s only the first of multiple resistance levels based on the previous serious move up. The fact that this level has been tested twice so far makes it slightly more important, but it still is only one of the levels, nonetheless. The volume is not supporting the appreciation. A move up on declining volume within a stronger trend to the downside is generally a bearish hint. And this is precisely the situation we’re seeing right now. And, quite importantly, the move up on declining volume is pushing the RSI higher out of the oversold level. This makes more room for potential declines without actually pushing Bitcoin through further resistance levels. This is not to say we can’t see more action to the upside, we can. But the odds, for now, seem to be in favor of a decline rather than a continuation of the correction. On Bitfinex, the recent appreciation is visible in comparison with the previous moves to the upside and the subsequent declines. From the get-go, we’re seeing that the recent move up is tiny when measured against previous rallies. This means that the action to the upside is not very strong at the moment. We also see an echo of what we wrote about the short-term outlook: the RSI is in a place from which there is a lot of room for declines. From the long-term perspective, the current move doesn’t seem like much. 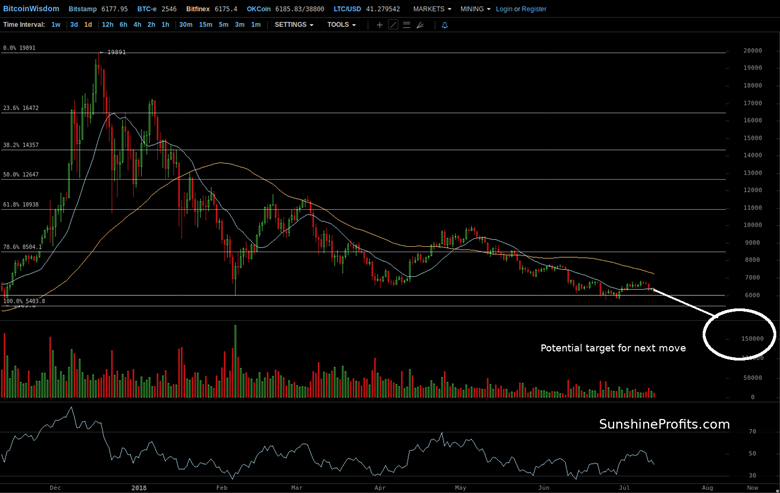 Right now, the level which seems to be in play is the February low at $6,000. And, in terms of Bitcoin volatility, the currency is not very far above this level. This means that the current move up is not a very strong one and could be reversed any day now. We could see a further move up above but, as we have stressed many times in the past, the fact that a move up could continue doesn’t necessarily mean that it will. Actually, based on the magnitude of the move up, the resistance levels, the volume, the RSI, and the lack of stronger bullish signals, the odds are in favor of a move down, in our opinion. And even if we do see a move up from here, betting on higher prices might not be the best idea as the currency could become very volatile and reverse to the downside not giving the traders time to get back on the short side of the market. Summing up, the recent move up is not strong enough to change the outlook, which remains bearish.